Explore hidden gems such as Teijo national park and Bellevue Beach. Get outdoors at Arboretum Mustila and Hiidenvuori. 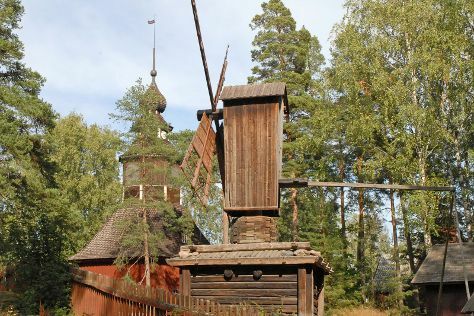 Get out of town with these interesting Helsinki side-trips: Fagervik Museum (in Inkoo), Porvoo (Cathedral of Porvoo, Porvoo Old Town, & more) and Nuuksio National Park (in Espoo). Spend the 27th (Sat) exploring nature at Ekenas Archipelago National Park. Spend the 4th (Sun) exploring nature at Sipoonkorven Kansallispuisto. There's much more to do: take an in-depth tour of Seurasaari Island and Open-Air Museum, find something for the whole family at Linnanmaki Amusement Park, take a stroll through Linden Esplanade, and browse the eclectic array of goods at Hakaniemi Market. If you are flying in from Italy, the closest major airport is Helsinki Vantaa Airport. In July, daytime highs in Helsinki are 25°C, while nighttime lows are 15°C. Finish up your sightseeing early on the 4th (Sun) so you can travel back home.